Acupuncture may be offered to you as a part of the physiotherapy regime. It is one of a number of different methods of treatment that your physiotherapist can offer alongside others such as exercise, joint mobilisation and general rehabilitation to relieve pain and help you return to good health. Acupuncture originated in China over two thousand years ago. The traditional Chinese medicine (TCM) model of this technique supports the concept of using needles inserted into the skin at specific points to influence the movement and level of ‘Qi’ (i.e. energy or life force) within the body. According to TCM theory, any change in the flow or balance of Qi can lead to pain, disease and disability. Scientific research has examined the effectiveness of acupuncture in various conditions. The use of acupuncture for the treatment of pain is supported by an ever-growing body of evidence. Acupuncture combined with physiotherapy is wildly accepted within both the National Health Service and private practice. This is evident by the recommendation from the National Institute for Health and Clinical Excellence (NICE) that acupuncture should be available as a cost-effective short-term treatment for persistent non-specific low back pain (source: NICE 2009). Following careful assessment, acupuncture will be suggested if your physiotherapist believes it will help to improve the effectiveness of your overall treatment. Physiotherapists use acupuncture to treat musculoskeletal pain, such as, back and leg pain, neck and shoulder pain, trapped nerves, muscle strains and spasms, headaches, arthritic and rheumatic pain. Acupuncture can promote relaxation and so reduce stress and improve sleep. Why choose a physiotherapist for acupuncture? 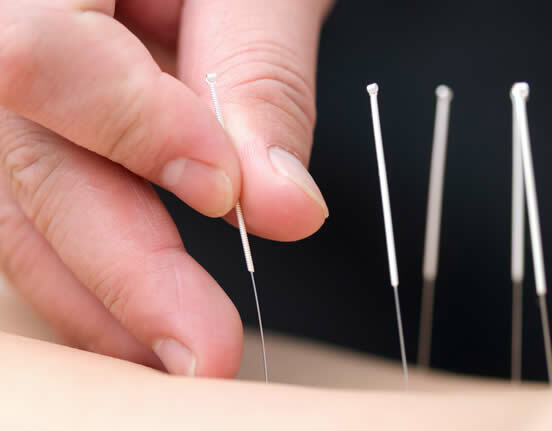 Your physiotherapist will use an individually tailored course of acupuncture for your symptoms as part of an evidence-based treatment programme. All physiotherapists using acupuncture are bound by rules of professional conduct and are required to train to a recognised minimum standard and adhere to a mandatory number of hours of continuing professional development. Physiotherapists use sterile, single-use needles. These are very thin, much finer than an injection needle and are inserted quickly through the skin into the tissues. Acupuncture should not be painful, although some people report experiencing a pinprick or scratch–like sensation. Once the needles are in place, you may feel a mild ache, warmth or heavy sensation at or around the area being treated. This should not be unpleasant. The feeling is known as ‘De Qi’ and is a sign that the body’s inbuilt pain-relieving mechanisms are being activated. Your physiotherapist may gently stimulate the needles to attain the feeling of De Qi several times during treatment. A treatment will usually involve the insertion of between two and sixteen needles. Needles can be inserted for as little as a few seconds or minutes. More commonly, needles will remain in place for between ten and thirty minutes. Needles may be inserted near to or around the painful area, away from the painful area (eg in the hands or feet), or on the opposite side of the body. The frequency and number of acupuncture treatments depend on the specific condition being treated and how you respond to therapy. Each session will be tailored to you and your condition. Research suggests that a course of six to ten treatments is required to achieve the best results for long-standing painful conditions such as osteoarthritis of the knee. Your physiotherapist will discuss your individual management plan with you.